The demand for Resident Evil 4 Wii Edition at retail stores is so great, that it has motivated Capcom to ship 750,000 copies of the game to retailers all over the world. This is quite significant, if we consider that originally Capcom expected Resident Evil 4 Wii Edition to sell 420,000 copies by the end of the current fiscal year. That has changed dramatically after it was known that sales of the Wii Edition had already broken with sales expectations within 3 months since it was release. Hopefully, Resident Evil: The Umbrella Chronicles will enjoy a similar reception when it ships later this year. A brand new Resident Evil: The Umbrella Chronicles was unvailed during the Leipzig Games Convention, edition 2007. The trailer shows scenes from RE0 that take place inside the train. Billy Coen & Rebecca Chambers face off against some Leech Zombies and Stinger, the giant scorpion. Another small scene shows Jill Valentine and Chris Redfield being attacked by a Hunter. 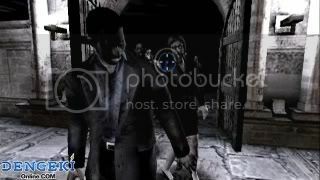 The video ends with some scenes related to the game, Resident Evil 3. Japanese website Dengeki, has published new The Umbrella Chronicles screenshots. UPDATE: New screens have been added to the Umbrella Chronicles gallery! To see the new screenshots, simply follow the link that I have placed HERE! Japanese magazine Famitsu published a new preview on The Umbrella Chronicles. The preview shows the new character model for Carlos Oliveira and some sections from the RE3 chapter included in the game. 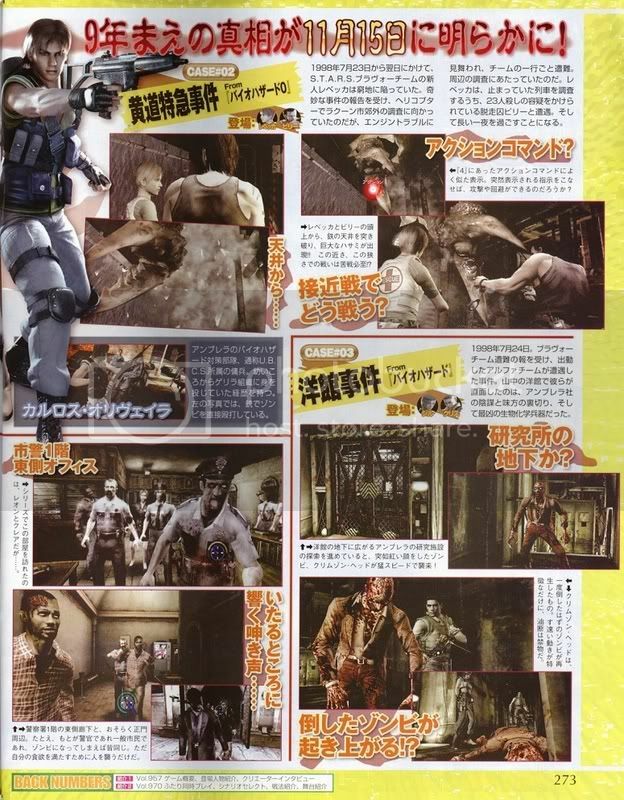 Also in the magazine, we can see some scenes from RE0 with Rebecca and Billy dealing with Stinger, the giant scorpion. As well as scenes from RE1 that show a Crimson Head. More importantly, a release date has been revealed (Japan only): November 15th. Here's a brief summary of what we known so far about Resident Evil 5. 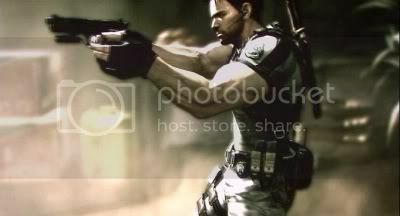 1.- It's been confirmed that the main character is Chris Redfield. 2.- The game is set in the year 2008 and Chris is currently working for an agency called the BSAA. 3.- RE5's gameplay will be based on RE4's. That includes the shooting mechanics and 3rd person perspective. However, new gameplay elements will be added to the mix. Like the effect that the searing heat will have on Chris. The player will need to provide his character with some refreshments in order to avoid body dehydration. If no fluid supply is found, the main character's mind will play tricks on him and he will see things that are not real. 4.- Aside from Chris, the player will be able to control an important female character. No info was given as to the identity of this character. However, most RE fans think that the mystery girl is none other than Sherry Birkin, the daughter of William Birkin. 5.- The generic enemies featured in RE5 are very similar to RE4's parasite infested Ganados. They are very human looking, attack in groups and employ a variety of weapons (pitchforks, axes, hatchets, etc.). It should be mentioned that these new enemies have better A.I. and are far more agressive than Ganados. 6.- Some weapons that the player will be able to use, include a machete, a regular handgun, a shotgun and assault rifle. 7.- According to director Takeuchi, the game will be released no later than 2010. However, Capcom expects the game to be released in 2008 or in the first months of 2009. 8.- During an interview, Keiji Inafune confirmed that RE series creator, Shinji Mikami, is not involved in any way with the RE5 project. Capcom Chief Financial Officer Kazuhiko Abe recently revealed that he expects sales of Resident Evil 4: Wii Edition to exceed the target of 420,000 units for the current business year (up until March 08), given the positive response from gamers and press alike. 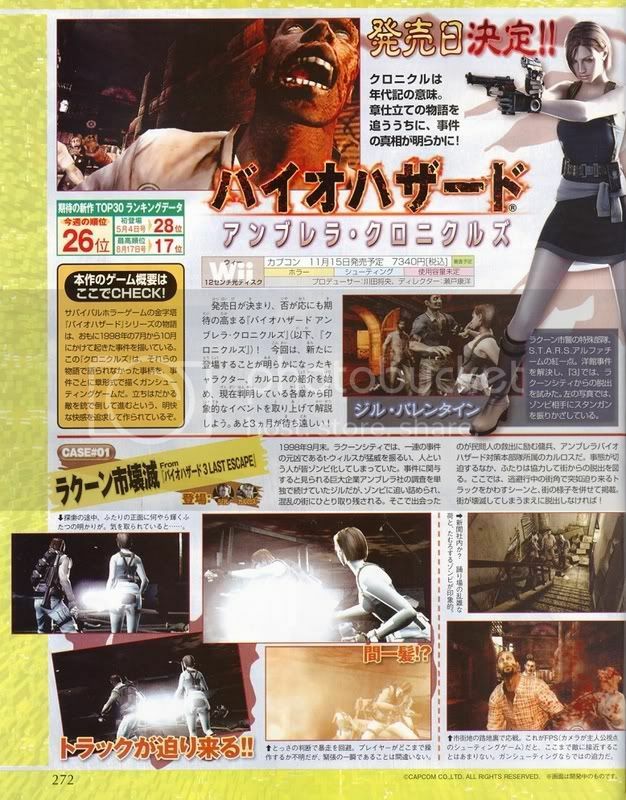 That's good news since the Kawata (responsible for the port and RE:UC) mentioned recently that if RE4 Wii Edition and UC do well on the Wii, we can expect more games from the series on Wii. He's actually interested in making remakes of the old games. Gametrailers.com posted yesterday a new video that show some gameplay elements from Resident Evil: The Umbrella Chronicles. The scenes are from the Resident Evil 3 scenario where Jill Valentine meets Carlos Olivera. At the recent press conferences held by Microsoft and Sony in Southern California, fragments of the new Resident Evil 5 trailer were unveiled. The new trailer shows scenes where the protagonist (rumored to be Chris Redfield), investigates a settlement located in what appears to be Africa. The place is heavily populated by normal looking residents. However, at one point of the video, the natives begin to attack the hero. It is not known if these natives are suppose to be the main generic enemies to be included in RE5. Such enemies would explain scenes from the previous trailer, where several individuals are seen running at top speed. They certainly don't look like typical zombies. Masachika Kawata, the man responsible for the RE4 port for the Wii and also the upcoming The Umbrella Chronicles, is considering making new remakes of past Resident Evil games for Nintendo's popular game console. He stated that in a recent interview for french publication, Jeux France. More surprising is the fact that Kawata mentioned that a port of Resident Evil 5 for the Wii would actually be considered. But only if sales of RE4 Wii Edition and RE: The Umbrella Chronicles were to meet expectations. The third official video for this game is out. The new video shows scenes from RE0, RE1 and RE3. On this new trailer you can listen to the voice acting a lot more. The video also shows how the co-op option will work. Both players shoot at the screen at the same time. But it seems that it only happens when the characters are being attacked. When they move around in corridors, labs or anywhere else, one player is always the lead and the other one just follows behind. To watch the new video, visit the site at: www.capcom.co.jp/bio_uc and once there, click the second button included in the page's menu. Then activate the button that reads: "PV Vol.3 2m18s. 15.9 MB". © Resident Evil 4 All is an Anakenobi (a.k.a. Pikminister) production. This site is not an official Resident Evil/Biohazard website. It is a creation of a fan of Capcom's famous survival-horror franchise. This fansite is not related with or endorse by Capcom. © Nintendo DS, Wii and GameCube logo are trademarks of Nintendo of America & of Japan. © PlayStation 3, PS3 logo and "PLAYSTATION" are registered trademarks of Sony Computer Entertainment Inc.
© Xbox, Xbox 360 and the Xbox 360 logo are trademarks of Microsoft Corporation.